We know Pippin is not really the color of green apples (he`s more like the color of Jujubes!). 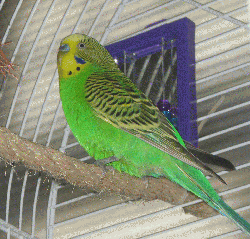 But Pippin is a good name for a budgie, and this Pippin is a very budgie-type budgie. He`s lively and curious and bright eyed. He wants to play and he thinks he wants to get to know people better. There are very few things in life that are cuter than a frisky little green boy-budgie. Just look at Pippin and you`ll understand.